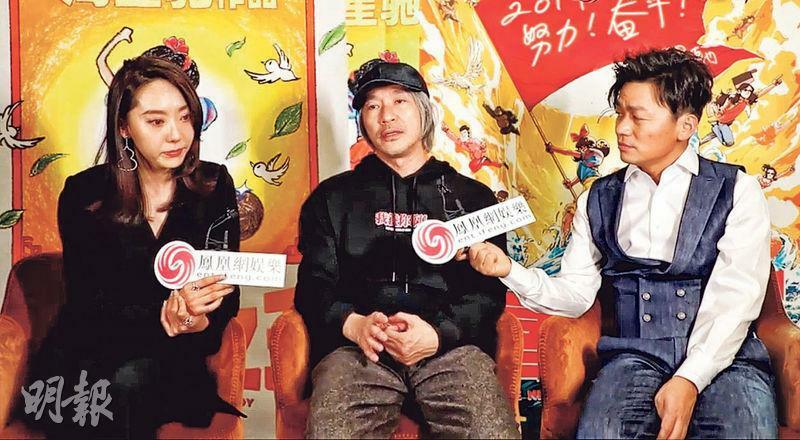 Stephen Chow Sing Chi has been promoting the Lunar New Year film NEW KING OF COMEDY (SUN HEI KET JI WONG). Earlier he led the leads Wang Baoqiang and Vin E Jingwen to a Mainland media interviw. NEW KING OF COMEDY was a story of temporary actors. Sing Yeh also shared his past as an extra. He revealed that he beg a director on his knees to reshoot his line. Sing Yeh was a graduate of the 11th TVB artist training class, among his classmates were Tony Leung Chiu Wai, Bobby Auyeung Chun Wa, Francis Ng Chun Yu and Wilson Lam Chun Yin. However before his training class he was an extra on RTV's I.Q. 1000 (IQ SING SHOOK SI). Sing Yeh said, "When I was an extra you weren't born yet. Once I had a line. I thought I didn't deliver it well. I was still thinking about it when I got home, why did I say it like that? I went back to ask the director, 'Can we reshoot my scene, can you give me a chance to deliver the line again?' The director stared at me. I remembered I might have gotten down on my knees, 'Director, let me say it once more!' Finally the director gave me a chance, at the time I was still on television. I forgot which series it was." E Jingwen was moved to tears. As for his future plans, Sing Yeh said that he would keep creating comedy. He wanted even more new comers to participate. As for whether he would perform on screen? He joked that he was no longer a new face. Earlier Sing Yeh was questioned whether NEW KING OF COMEDY was a "refried rice" product. He said, "I have made Yang Chow Fried Rice, but I really haven't made refried rice."